22 parts of Oceania in a fun online geography learning game. 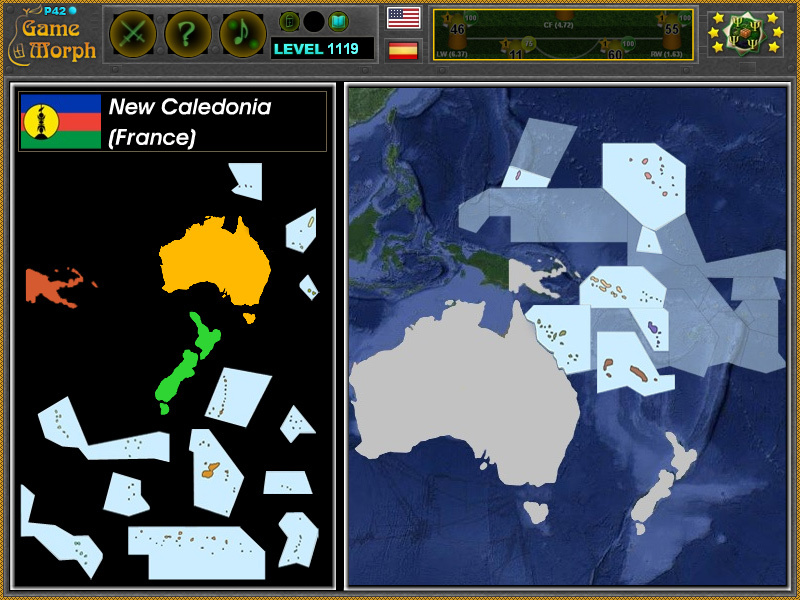 "Oceania Puzzle" is a small knowledge level game, to drag and drop the countries and the islands of Oceania in their correct places. Interactive map of Oceania continent. Free online game to study Australia and Oceania continent. Fun educational geography game, suitable for online lessons and interactive classes. Minute to win it game. Simple world map. How to play Oceania Puzzle. There are 22 Oceania graphic pieces, situated on the left side of the screen. Drag and drop them in the correct place in the outlined territories of Oceania continent to the right of the screen. If dropped incorrectly, the islands will go back in the hand, until placed in the right place. Know at least 5 islands in Oceania and get +1 Knowledge Level. Oceania is a geographic region comprising Melanesia, Micronesia, Polynesia and Australasia. This game covers the western part of the islands and their regions. Situated in the southeast of the Asia Pacific region, Oceania is the smallest continental grouping in land area and the second smallest in population after Antarctica. Oceanian islands are of four basic types: continental islands, high islands, coral reefs and uplifted coral platforms. High islands are of volcanic origin, and many contain active volcanoes. Among these are Bougainville, Hawaii, and the Solomon Islands. Which are the Oceania islands? Which is the biggest country in Oceania? What are the political borders of oceania islands? What are the flags of Oceania countries and islands? Where аре Solomon Islands situated? Where is New Zealand situated? Where is Papua New Guinea situated? Labels: Puzzles , Continent Games , Learning Games , Geography Games , Australia Games , Free Online Games.